Centre Alliance Senator Rex Patrick recently visited Whyalla ahead of two public hearings in Kimba and Hawker for the federal inquiry into the selection process for a national radioactive waste management facility. Senator Patrick, who initiated the senate inquiry, said he was ‘very concerned’ how fair the selection process for the site had been so far. “I want to make sure that even the people who are on the other side of the decision can say that it was a fair process,” he said. Mr Patrick said there is a site in Western Australia which has ‘considerable support’ as a location for a nuclear waste facility, and believes it should be included in the nuclear discussion. “We shouldn’t be holding back on that particular site. My worry is that even if we get across the line in Kimba or Hawker, we’ll have a bitterly divided community,” he said. CALLS from the Fairfax branch of the LNP to investigate nuclear power at their state conference in Brisbane this weekend does not sit well with me. Three energy-related motions submitted to the convention from Federal MP Ted O’Brien’s Fairfax branch call for the Federal Government to adopt policies to support the building of new coal-fired power stations with the ability to deliver reliable and economic power, that the Federal Government reduce current subsidies paid to the renewable energy industry and that the feasibility of nuclear-powered energy generation is investigated. Dave Dehelpe No Nuclear Waste Dump Anywhere in South Australia 6 July 18 Unless Mz Orman has dicovered a method of transporting the waste without passing through other towns or properties in S.A. then it is essential that the rest of S.A. claims the same voting rights that she wishes to deny all South Australians. Steve Dale She says – “I do trust and believe that this facility will not have a negative impact of the community of Kimba” – too late, the sweaty desperation of the nuclear pushers has already caused a huge amount of damage to South Australians. “Trust” – I wouldn’t trust them as far as I could throw a container of High Level Waste (which they call “Intermediate” – trust blown already). Jillian Marsh No Nuclear Waste Dump Anywhere in South Australia 6 July placing faith in ‘worlds best practice’ without fully understanding what this means or who peddles this propaganda seems such a naive thing in today’s world. We as members of the public can easily locate information online that contradicts the spin doctors of the nuclear industry – not just on the basis of economic viability, but also on the grounds of lack of an adequate and thorough community engagement process, as well as on the failed track records of governments and the nuclear industry all over the world who consistently fail to contain toxic radioactive contamination. So I suspect that the YES people are being seduced by the prospect of wealth, both personal and collective, and for the non-Aboriginal folk out there who say YES to a dump, if it ends up being a disaster and contaminates the land you can just pack up and move onto another farm, buy a house in another town, send your kids to another school and move interstate. New research: Climate scientists underestimated speed of global warming and of sea level rise? temperatures of the 19th century. scientists used a range of measurements to piece together the impacts of past climatic changes to examine how a warmer earth would appear once the climate has stabilised. Earthquakes happen in the Kimba area – not a good place for a nuclear waste dump. A new study led by chief scientist Alan Finkel has underlined Australia’s role as a leader in the household battery storage sector, and says Australia can, and should, be a leader of energy storage of all types. In a dramatic conclusion to a meeting that failed to approve any finance for the developing world, Howard Bamsey announced his exit from the Green Climate Fund. I originally grew up in Adelaide, South Australia, but have been coming to Kimba for the past five years and officially moved in 2017. My partner is the fourth generation in the process of taking over the family cropping farm in Kimba, that has been operational for the past one-hundred years. I work at Wudinna hospital as a Registered nurse commuting between Wudinna and Kimba. It is my pleasure to be able to provide my personal opinion and relevant information to the inquiry on the process of the National Radioactive Waste Management Facility (NRWMF) site selection process in Kimba, South Australia. I give permission for this submission to be made public and would be willing to speak with the Senate committee to answer any further questions they may have in conjunction with Kimba’s process through this nomination. The financial compensation offered to the land owners of Kimba who put their land up for nomination is not an over-generous amount of money. It is only a small percentage of the money that cropping can bring into a business over many future years. The price offered is not going to impact the overall business, give the farmer an advantage or disadvantage or affect any surrounding neighbours. In my opinion, I cannot see that the money offered was the main driving incentive for people to nominate their land. When the NRWMF approached people with the idea and compensation, it was in their best interests for their family, community and full belief that the facility would not cause any reason for concern. Broad Community Support is defined as a gathering of expressions by a community. [??] There may be broad community support even if some individuals or groups object to the project. But by addressing the community’s majority opinion and accepting that they have their own opinion and not criticise another community members view. A community member is a person who; lives, shops, works, volunteers, or sees themselves as an accepted member of a town. Everyone who defines themselves as a member of the community should accept everyone else in that community and let them have a say. As wished by the community of Kimba, the Australian Electoral Commission vote for registered voters in the Kimba electorate was allowed, so that it was fair to all. The results showed after the June 2017 vote, that majority of the town ( 57.4% ) was in favour for Kimba moving to Phase two of the project, not to receive the site, but the consultation stage. 2) It was also raised to people who were not on the Kimba electoral role to apply to vote if they thought they had a strong interest in the decision. 3) The District Council of Kimba has openly supported the process through to phase two. 4) As per the NRWMF guidelines, the two Kimba nominated sites had 90% direct neighbour backing. 5) The traditional owners of the land have been informed of the assessment of the two Kimba sites for this facility. They have not expressed opposition to the facility being located in Kimba (to my knowledge) to date. Like many rural community towns, Kimba is slowly declining in numbers, especially in low rainfall areas. Many people, including myself, want a way to ensure that this beautiful town will still stand for many more generations to come. Numerous people see that this project will ensure job opportunities, infrastructure and can make sure this part of Australia does not vanish from our maps. To my knowledge, there are no traditional owners from this region living and active in the Kimba community. I am positive that the department are in contact with the Barngarla people, who are the traditional owners of the land. I am aware that the Barngarla owners visited the two nominated sites in March 2018. As far as I know they didn’t raise any issues or concerns with the proposed project. I believe that the elders will always be in the loop of the process that Kimba has entered. I am confident the department will engage them in decisions and ideas when it comes to a potential new project like this in Kimba. I think the best idea for this committee is probably to ask the department and those traditional owners directly about the process. They are going to know better than most people making these submissions. Kimba has been seen in the media a lot since entering this process, and a lot of the comments made about our town has mostly been negative. This really upsets me when people on social media, and even surrounding towns/ cities go out of their way to degrade my town and tell me “how could you do this to our country?”. It is not just once person’s decision, and I feel I am a part of this community enough to have an educated opinion about this matter. I am now a registered voter of the Kimba electoral role. I will continue to vote ‘Yes’ for this facility, so I can ensure that my future children have a town that exists, and they are happy and healthy in the town of Kimba. It has been a bonus to find out that Kimba was eligible for a two-million-dollar community benefits fund to help the community thrive. This is a chance for us to better our town in lots of meaningful ways. It recognises that we have taken part in something other communities wouldn’t. I think that’s fair. I hope that it is understood that the community of Kimba did not vote ‘Yes’ because of the money. I see that the majority of people in Kimba are following this journey because of the passion and end result we hope to get to, and that is to provide a safe place to dispose of and store radioactive material for Australia, at the same time as offering some long term social benefits to our community. I have been very happy, and comfortable with the process thus far. I have attended many community meetings and have heard from many professionals in the topic of radiation. I was lucky enough to be able to visit ANSTO with a group of people from Kimba to learn more about radioactive waste storage. I was amazed at what I learnt, and it cemented my opinion on the topic. The trip really opened my eyes as to the type of waste that would be stored in our facility, we were able to go up and enter the facility where the medical drums are kept and were even able to go up and touch the drums ourselves. I came away from that trip with a really cemented understanding on the specific products that will be potentially stored in Kimba, and I feel that I have enough knowledge to have an un-biased opinion. I do trust and believe that this facility will not have a negative impact of the community of Kimba. I do not believe that it will have an adverse impact on grain sales, land prices for anyone in the district. As this facility would only affect people in the district of Kimba, I feel it is only up to the people in that district. Their opinions matter the most, and those people only should have the vote on whether this facility goes ahead. The town of Kimba defiantly has some people who like to have their voices heard, whether it is negative or positive, between other community members! Since this process has started, the community has continued to work, and everyone socialises with everyone in the town. Some people make this matter cloud their opinion on others, but that is up to them. Everyone has a right to their opinion and it’s normal that a town from is made up of diverse opinions. I do not believe the town of Kimba has divided, just that some people chose to segregate themselves from normality. I believe if people wish their voices to be heard that they should do so and do it with respect and non judgment. As I have been brought up if you have nothing nice to say, do not say anything at all. I look forward to the findings on the enquiry. The Turnbull Government will be urged to consider developing a nuclear power industry under a plan to be debated at the LNP convention, with two of the potential locations being popular seaside areas in southeast Queensland. THE Turnbull Government will be urged to consider developing a nuclear power industry under a plan to be debated at the LNP convention. The controversial resolution, proposed by Fairfax MP Ted O’Brien’s branch, could lead to a plan for generators across the country if it is adopted by the party and then acted on by the government. The branch does not list possible sites for nuclear power plants in the resolution but urges the Federal Government to “consider the feasibility of nuclear powered energy generation in Australia”. 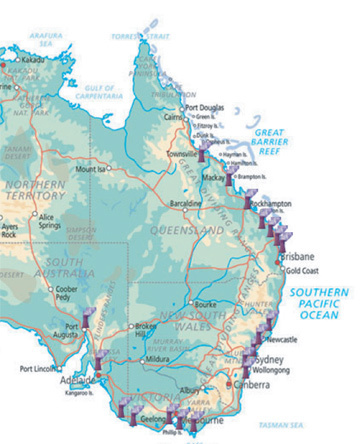 A 2007 Australia Institute study identified 17 suitable sites for nuclear power plants including six in Queensland — Townsville, Mackay, Rockhampton, Bundaberg, the Sunshine Coast and Bribie Island. That study chose locations using key criteria including existing electricity infrastructure, centres of demand, transport infrastructure and access to large quantities of water for cooling and warned setting up a nuclear industry in Australia could prove unpopular. “If the Federal Government decided to promote the establishment of a nuclear power industry in Australia, the siting of the power plants is likely to be one of the most politically contentious issues,” the report said. The Fairfax LNP branch has proposed three separate resolutions on energy policy to be debated at the convention, which starts in Brisbane on Friday. Other resolutions from the branch call on the government to “reduce the high level of subsidy paid to the renewable energy industry” and “support the building of new Coal Fired Power Stations that have the capacity to produce reliable and economic power”. IN the eternal search for a headline, there are few things more predictable than political conventions. They are places to air outlandish ideas that give the lower party ranks some illusion of influence and to float pet notions. They are also the place to flog dead horses. And there can be few horses more dead than the idea of nuclear power in Australia. But undaunted by history, Ted O’Brien’s Fairfax branch of the Liberal National Party will urge the Federal Government to consider a nuclear power industry when it takes the floor at the LNP’s state convention beginning today. Fortunately, the decisions of the convention are not binding on the Government and, I suspect, the suggestion will be allowed to die a natural death. The problem for the proponents of nuclear power is that we’ve been down this track before and not all that long ago. In fact, we’ve been talking about nuclear power since 1952 when then South Australian premier Thomas Playford confidently proposed that one be built on the shores of Spencer Gulf. The next and probably most serious proposal was to build one on Commonwealth territory at Jervis Bay in 1969 but this idea went into meltdown when the locals got nervous and the unions got aggro. Ted O’Brien’s Fairfax branch of the LNP will urge the Federal Government to consider nuclear power, despite the fact every party knows it could simply never happen. And so it went on over the decades, with the idea intermittently erupting like a dyspeptic belch and then subsiding. It got almost serious in 2006 when Prime Minister John Howard was starting to accept at the very least the idea of containing emissions even if climate change was a bridge too far. He launched what he called a “full-blooded debate” and commissioned a report by former Telstra chief Ziggy Switkowski who reckoned we could have the first nuclear reactor in Australia (he meant power stations as we already have a reactor) in as soon as 10 years. The headline was that we could have 25 nuclear stations producing a third of Australia’s electricity by 2050. What took the fizz out of the fission was just where these 25 reactors would be built. Opposition Leader Kim Beazley and Kevin Rudd taunted Howard to name the sites but he refused to be drawn on specifics, leaving others to draw their own conclusions. The four main criteria for the siting of nuclear power plants in Australian had generally been accepted as proximity to appropriate existing electricity infrastructure; proximity to major load centres (i.e. large centres of demand); proximity to transport infrastructure to facilitate the movement of nuclear fuel, waste and other relevant materials; and access to large quantities of water for cooling. The Australian Institute is routinely disparaged as “left leaning” but I saw nothing then or since to challenge its conclusions on prospective nuclear sites. The earthquake and tsunami in the Miyagi prefecture in Japan sparked a nuclear disaster in 2011. In 2006 the Institute reckoned about half of the population opposed nuclear energy and “two thirds say they could opposed a nuclear power plant in their local area’’. If the nuclear industry was still looking at the same backyards, it is reasonable to presume it would come up against the same public sentiment. The other problem was that Switkowski concluded nuclear power was likely to be between 20 and 50 per cent more costly to produce than power from a new coal-fired plant. Unless they have been major advances in nuclear technology in the past 12 years, that same formula would apply. In 2006, Switkowski was able to breezily report: “Since Three Mile Island in 1979 and Chernobyl in 1986, the nuclear industry has developed new reactor designs which are safer and more efficient.’’ Then along came Japan’s Fukushima disaster. These are the sorts of things the old folk seeing out their days in the sun on Bribie have plenty of time to think about. If the motion is debated seriously this weekend, proponents may be able to produce much in the way of supportive technical and financial evidence, even warming up the Switkowski report. But that will count for nothing when it comes to the Not In My Backyard syndrome and politicians of all shades know it. My name is Daryl Koch and I was born in and lived in Kimba all my life. I am a wheat and sheep farmer and three generations of my family have farmed in the Kimba district. I am on several committees in Kimba and volunteer with our local sporting clubs. I care deeply about my town and community remaining viable into the future for my children and grandchildren. I am pleased to be making a submission to the enquiry to address the terms of reference. I am comfortable with my submission to be made public. To date the appropriateness and thoroughness of the site selection in search of a national radioactive waste management facility (NRWMF) has been thorough, transparent and fair. In February 2018 I visited ANSTO at Lucas Heights in NSW to see the nuclear medical reactor and to see firsthand the types of low and intermediate level waste that would be held at the NRWMF. I was very impressed by how professional and carefully the people of ANSTO operate this facility and how well-managed these radioactive waste streams are. I have actively taken part in the consultation process here in Kimba and I do not have any concerns for a radioactive waste facility being built either here in the Kimba district or elsewhere. Every person on the electoral roll in the District Council of Kimba was given the chance to vote to go to stage 2 (consultation stage) of the NRWMF. Also people who believed they had an interest in Kimba could apply to the council for a vote eg owning a business, owning land in Kimba, work and live in Kimba but not yet on electoral roll. This Australian Electoral commission voting process was fair and trustworthy to every adult who was invested in Kimba and its future. In my opinion any percentage over 50% is a majority win and constitutes ‘broad community support’ for a project. The new Marshall Government in SA won the election with 37.9% of the electoral votes and is now in Government and that is ‘broad community’ of voters in South Australia. In addition to the AEC vote, all but one direct neighbor (to both the nominated sites) is in support of living and farming near a radioactive waste facility and that must also be added to support the term ‘broad community support’. how any need for Indigenous support has played and will continue to play a part in the process, including how Indigenous support has been or will be determined for each process advancement stage; I am aware that the Indigenous groups (Barngarla people) have been acknowledged and consulted throughout the process. Any indigenous people living in our community have had access to the same information process as I have and will have the same opportunity to vote as I have. I don’t believe people voted yes to go to phase 2 for the promise of money. Only the cynics amongst us would believe this. People have voted yes to get more information about the project and to ask questions of experts about the safety of radioactive waste, how it will be stored and how it will be transported. The community benefit program is an added bonus for being in the process and will benefit many community projects. People from both sides of the argument about the facility have applied for funding of a project. We are all smart enough not to vote yes to have the facility built in our district for the promise of money. I will vote yes when I am assured that the facility can be built to international best practice and that there will be no adverse effect to people, the environment and our livelihood. e) whether wider (Eyre Peninsula or state-wide) community views should be taken into consideration and, if so, how this is occurring or should be occurring; f) any other related matters. The people of Kimba are the only ones whose views should be considered when voting to advance in any stage of the Kimba nominations. I don’t believe this facility will have any negative impact for our Kimba community or any other community, so I don’t think we need the approval of a neighboring town, regional centre or the state. Lobby groups and Nuclear activists have been questioning the ‘process’ and spread false information but they have no interest in Kimba or the people of Kimba or any idea of the level of participation in the process the people in Kimba have made. The department have had a business space in Kimba for two days a week for nearly a year. I have been able to walk in and ask questions and request people I would like to speak to or hear from. They have also sent out frequent newsletters and information brochures. I have been to public information sessions at the town hall and at the Hotel. I have heard from specialists in radioactive waste treatment, radiation experts, General manager of Ansto nuclear medicine program, listen to and ask questions to speakers from France that have a similar facility in their community. I was also able to visit Ansto (fully funded trip) to ask further questions and to see for myself the types of waste and how it will be transported. I have also had access to newspaper articles, radio and tv interviews and access to the internet. The people of Kimba are able to make an informed decision for ourselves about our town. Outsiders should not be able to make decisions for our town. Changing the process in a search for a Radioactive waste facility in Kimba or for any future nominations would destroy the integrity, appropriateness and thoroughness of the site selection process to date.